Arm height is 21 1/2". Taupe Soft Touch faux leather upholstery. Wonderfully comfortable, this contemporary recliner also offers a sleek and stylish profile. 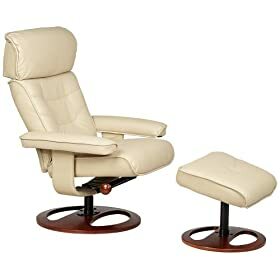 It features a solid wood base with taupe faux leather Soft Touch upholstery. Named for its soft hand, Soft Touch is a polyurethane fabric that is highly durable, waterproof, easy to clean, colorfast and eco-friendly. Chair swivels a full 360 degrees. A matching ottoman makes this the perfect seating for reading, relaxing or watching TV. Vacuum regularly with soft brush attachment along stitch seams, creases, and spaces that touch skin. Wipe regularly with a soft, color-fast cloth dampened with plain water. For a deep clean, use a high-quality leather cleaning product, or a mild non-detergent, non-alkaline soap.